If you read “Music Therapy: Making a Difference One Note at a Time” and you have been following the press releases about the role of music in Congresswoman Gabrielle Giffords’ recovery from traumatic brain injury, you may be wondering if you should enter this profession. If so, how would you go about selecting a music therapy program? The website of the American Music Therapy Association (AMTA) is a great place to start. Then you can move on to numerous books and articles concerning music therapy. Reading will continue to inform you, through case example and theoretical explanation, what the work is really all about. Reading also forms a basis for intelligent questions when you meet with faculty interviewing you for their programs. Contact AMTA for regional information where you can find music therapists to observe. Seeing is believing, and you may even want to volunteer with a music therapist for a period of time to decide if this is truly the profession for you. That was what I did many years ago. Proximity to clinical facilities is particularly important during training in a music therapy program. You do not want to be in the middle of nowhere no matter how beautiful it is. Training as a musician is integral to your role as a music therapist. The strength of the music school in terms of faculty, students, ensemble offerings, and curriculum is key, no pun intended. Music therapy is truly an interdisciplinary art and science. You want to be at a school with a strong general education component, opportunities for developing your writing ability, and connections with a strong psychology department. Accredited academic music therapy programs are indicated on the AMTA website. Don’t let an institution advise you that you can become a music major and a psychology minor and go on to practice music therapy! Music therapy has been an independent academic training program since 1950. Look for a music therapy program where there is diversity of faculty: at least two full-time faculty, preferably supplemented with adjunct faculty, with varying areas of expertise and clinical experience. Ask specific questions about how much clinical training opportunity each program provides and if you will receive both on-site and faculty supervision. Music therapy is an intensive and demanding curriculum that requires a smaller class size, ideally no larger than 20. Karen D. Goodman, Professor, Music Therapy at Montclair State University in Montclair, New Jersey was educated at University of Wisconsin-Madison, City University of New York-Hunter College, Montclair State University and New York University. Professor Goodman is a seasoned educator, clinician, supervisor, administrator and author. Her recent publications include Music Therapy Group Work with Special Needs Children: The Evolving Process (2007) and Music Therapy Education and Training: From Theory to Practice (2011), both published by Charles C Thomas. According to the American Music Therapy Association (AMTA), if you have a bachelor’s degree in music but not in music therapy, you can apply for a 60-credit, 3-year combined equivalency/master’s degree program. For a complete list of music therapy degree programs, visit AMTA’s website. Is Music Therapy a Good Fit? Music therapists are highly creative, energetic, and positive. They are interested in people and have a desire to help. They demonstrate strong communication skills (as they are required to document assessments, evaluate progress, and defend services) and work well with others. Because music therapists are able to work in a variety of settings and with numerous populations and age groups, they are able to adapt techniques and strategies, thereby individualizing treatment depending on client needs. Other important attributes include being empathetic, patient, imaginative, open, and understanding. Perhaps most importantly, though, music therapists, like their clients, have a love for music, although unlike their clients, prospective music therapists must have a background in music. Consider volunteering in settings that utilize music therapy to see whether this is a career field that fits your interests and personality. Hi, I’m currently going to my local community college for business, but I am really thinking for changing to Music Therapy. I’ve been doing a lot of research about it and I have found a school that has a Music Therapy program. What should my steps be? If I was to go to this school, I would want to maybe talk with someone who is a Music Therapist. Also, are music therapist in demand? All of the schools we work with that offer music therapy are linked on each of these articles. Click on at least a few of these schools and then click on their application and audition links. This will give you an idea of what you’d need to be prepared to do in order to be accepted to schools that offer music therapy. You’ll see that you’re required to audition on a primary instrument. Though the bar isn’t as high as it would be for a performance major, applicants still need to show proficiency on their instrument. Note that as a music therapy student, you’ll also need to take classes and pass proficiency exams on voice, guitar and keyboards as these are the most utilized instruments in this profession. Read all of the articles on MajoringInMusic.com about music therapy in order to get a firmer grasp on what it takes to apply, audition, be accepted and then work in this field. Once you’ve selected schools where you’d consider applying, be sure to read their websites carefully about their audition requirements. Also look for their information about transferring. You’ll want to find out whether there’s any chance of getting credit for any classes you’ve already taken at your CC. I have a BM in Music Theory/Literature with a proficiency in both piano and vocal performance. I am currently half-way through my Master of Music in Music Studies. To pursue a career in Music Therapy, what step should I take next? Could I study for the exam and take that for certification, do I complete a Master’s in Mus. Therapy, or do I complete an equivalency program only? Thank you!! So I’m preparing for my college audition coming up but I was wondering if those who are pursuing a music therapy major are judged differently or are admitted based on separate terms and conditions in comparison to those auditioning for a music performance major in the same college music program? Great question. We posed it to some of the participating schools with music therapy programs on MajoringInMusic.com. They all have their own unique standards for acceptance. Some seek to fill ensemble seats through prospective student auditions, so that will be a prime focus in their decisions about who they admit. Others schools require all applicants to first meet a specific threshold. Once meeting that, a music therapy applicant would not be held to as high a level of musical and technical competence as a performance major. I’m going to be a senior next year and I’m very interested in Music therapy. I’ve read up on most of the articles and have researched the major and my principle instrument currently is the cello; however, I understand that I need to demonstrate proficiency on the piano, guitar, and voice to be certified. So if I audition for college with cello and get accepted, does that mean I have to continue playing the cello or do I focus more on the required instruments for certification? We asked Baldwin Wallace Conservatory, where music therapy is one of several programs offered, for help in answering your question. They told us that Bachelor of Music students continue studying their primary instrument via private lessons and ensembles. We suspect this will be the case in other B.M. degree music therapy programs as well. Hi! I majored in Music Performance in my undergrad and would now like to do Music Therapy for my Masters. I am also very interested in studying abroad. Are there any major differences in the programs, training, and accreditation for therapists who study abroad? Additionally, would I need to go through the American Board for additional accreditation once I return to the United States? Thank you! Look at the European Music Therapy Confederation’s website as well as the American Music Therapy Association’s list of “Worldwide Music Therapy Organizations” and “International Music Therapy Associations.” You can compare the international requirements for certification to those listed on the AMTA’s websites for US schools. If you still have questions, we recommend you contact AMTA headquarters directly. I am currently a student at WSU in Utah. I love the music program here and would love to help people through music therapy. Unfortunately they do not offer a Masters degree in Music Therapy in Utah. So I’m curious, to save a ton of money, if it would work to do a Bachelors of Integrated Science degree instead and then transfer to a school that offers a Masters degree. The BIS degree would allow me to focus in three areas. I am thinking that Music, Psychology, and Family Studies would be a great fit. Would they accept me into the Masters program or would I have to get a Bachelors in Music Therapy? In view of what you say here, before you go any further, read this article if you’re considering music therapy as a career: Equivalency Program in Music Therapy. My daughter is a senior in high school and has been accepted into several music therapy programs. One of the schools offers a B.S. in Music Therapy; the others all offer a B.M. in Music Therapy. What is the impact of a B.S. rather than a B.M. (or vice versa)? Since schools in the U.S. abide by the regulations of the American Music Therapy Association, there will be similarities in curricula at each of the schools. We would not be concerned about a BM vs. BS degree – schools don’t necessarily name their degrees in the same way. Instead, we recommend creating personal criteria for making a decision, based on factors such as faculty, location, facilities, music environment, cost, etc. A final visit to schools under consideration may be useful if a decision is difficult to reach. See “10 Considerations for Visiting Music Schools”. Would it be wise to pursue a Music Theory Degree at my current Non-AMTA university and plan on pursuing Music Theory for grad school or would I be better off transferring to a school that offers Music Therapy as a major and is AMTA approved? My end goal is to become a Music Therapist and have the most education in this field as possible. A music theory degree (like any music degree that is NOT in Music Therapy) will set you up to take the Equivalency Program in Music Therapy offered by several schools. See our article: Equivalency Program in Music Therapy. That said, we wonder if you’d be accepted as a music theory major without being able to read music. Talk with your current school to see if it’s even an option. Be sure to check the requirements for applying and auditioning at various schools with Music Therapy programs if you are considering transferring schools. Note that all expect you to pass proficiency exams in voice, keyboard/piano, and guitar in order to graduate. While you would get training in all of those, a background in guitar plus at least one other instrument would be helpful before you start a Music Therapy program. I am a Junior in high school currently and I am very interested in the Music Therapy programs because i have a special needs brother who loves music. Currently I only have one instrument and that is my voice. I am planning on starting piano this summer and I can sightread pretty well. I know that i need to improve on my sight reading skills but i am very worried that with only slight piano skills i will struggle in the program. What could i do to help ease my worries with this or what would you recommend in my situation what to do? We hope you’ll read all of the articles about music therapy here on MajoringInMusic.com, as well as visit the website of the American Music Therapy Association. You’ll find very useful information and answers to questions you didn’t even know you had! With another year to go in high school, you still have time to improve your piano skills before audition time next year. As a music therapy major, classes in voice, piano, and guitar will be part of your program so that you can pass the necessary proficiency tests before you graduate. These are the areas of music used most often in music therapy. Having some background in one or more of these areas will be very useful. But don’t feel you have to be a master of all three in order to apply! I am a high school sophomore, and I have a great singing voice, but I never had any singing lessons and I am making research on music therapy. Do I have to know how to read music sheet to be admitted into a college? I need information about being a music therapist. You will need to apply and audition to get into a music therapy program. You will also need to be proficient on keyboards, guitar and voice by the time you graduate – and it’s helpful to get started with lessons on at least one while you are still in high school. Read our articles on music therapy to learn more. Good luck to you as you move forward! The first semester of being a music major of any kind is the most difficult! If you don’t read music prior to entering college you will struggle greatly. I know several people who entered a music program without reading music. A few of them were successful. The rest changed majors. Take some voice lessons so you are ready to sing at a university level. Also, take some piano lessons! Tell the instructor you need help preparing to be a music major. Learn to read treble and bass clef. Learn all major and minor scales; know their key signatures. I am obtaining a major in music and am almost at the end of receiving my bachelor’s. I have an interest in music therapy and my advisor suggested a master degree in music therapy.. would I be heading in the right direction? It all depends on whether music therapy is a good fit for you! Take a look at our articles on music therapy as a career. Then, if you’re still interested, learn whatever you can about equivalency programs. You will be required to apply for that if you want to pursue music therapy, since that was not your undergrad major. Note that several programs that offer equivalency programs do offer them in conjunction with master’s programs in music therapy. Please feel free to contact Larisa McHugh at lmchugh@smwc.edu, who is the Program Coordinator for the Saint Mary-of-the-Woods Music Therapy Equivalency Distance Program with any questions. I would like to major in music therapy, but my only instrument is voice so I’m worried I won’t get accepted into any school’s music therapy program without knowing how to play the guitar or piano. Also, my sight reading skills aren’t that strong? What advice do you have for me to pursue and succeed at this career and advice for college auditions and applications? If you are proficient enough to audition on voice at a music school with a music therapy program, you will take classes in guitar and keyboards. All three are required to pass the exams to become a credentialed music therapist. Sight-reading is an important aspect in any performance area, so we suggest you build your skills now. Read all of the music therapy articles on MajoringInMusic.com to learn more about this wonderful career field. I currently finished my first year of college in radiology but I recently figured out that I want to pursue music therapy. I am considering leaving my current university and just pursuing an online degree, because I live in Puerto Rico and we do not have Music Therapy Degrees. I have looked at the AMTA approved list of schools but was wondering which schools addresses my problem the most. I know that I must travel to the school I selected several times a year and would like to know all about it. Additionally I am interested in knowing about scholarships. We are only aware of online master’s degree programs in music therapy for those who already have an undergraduate music therapy degree, and online Equivalency programs in music therapy for those with a bachelor’s degree in music in a field other than music therapy. Once you apply to any school, they will review your application and financial need information and determine whether to offer you a scholarship. Also check on opportunities through your home town, religious institution, family workplaces, your bank, etc. I am a professional musician, 38 years old and looking to get a BA in Music Therapy. Can you please advise on any online schools, also recognized by the American Music Therapy Association? I’m looking to do this also while running my music production company here in Colorado so I think online classes are potentially the best route. We suggest you contact the American Music Therapy Association directly. We are only aware of a couple of online music therapy programs – at Saint Mary-of-the-Woods, an online Equivalency Program for those who already have a degree in music but not in music therapy; and at Colorado State University, an online master’s degree in music therapy for those with an undergraduate degree in music therapy. You can check both of these schools out by clicking on their links on this article. I’m in high school but am trying to plan ahead as much as possible for college. I want to ultimately pursue music therapy, but only one school I’m looking at offers it as an undergraduate degree. It is by far not my favorite school, so I’ve been looking into other schools for their music programs with the idea that I’ll go for the Music Therapy degree equivalency program after my initial bachelor’s studies. My question is, would it be easier to move on to an equivalency program with a degree in General Music, or Performance? Or does it not matter as long as my undergraduate degree is in a music-related field? My main instrument is voice, if that makes any difference. Thank you for any assistance you might be able to provide. You should be able to do the Equivalency Program with any undergraduate degree in music. But check with a few of the schools you have your eye on, to be certain. You’ll need to demonstrate proficiency on piano, voice, and guitar in order to become a credentialed music therapist, so be sure to figure that into your plans. Hi, may I know what are the best and most reputable music therapy schools in the US? There are pros and cons to every program, depending on who you are, what your personal criteria are for choosing a school, and what your career goals are. You can find every program credentialed by the American Music Therapy Association on their website. But unless you first create your own list of criteria, no matter how good a school looks, it may not be the right fit for you. My daughter was just accepted to the music therapy program at Queens University of Charlotte and the program at Seton Hill University but conditional. I dont understand the conditional part??? I am weary of sending her to a program on a conditional status when she was accepted to Queen’s full out especially when Seton Hill can still say NO and then she has lost her chance at Queen’s. I am wondering if anyone knows how difficult is is to pass later on a conditional status and if anyone can point me in a direction to help her make the right choice! The “conditional” status typically means there’s something missing or something more your daughter needs to do for full acceptance. We’d be surprised if they didn’t already provide her with this information. We encourage her to talk directly with the admission office at the school or the individual who sent her the conditional acceptance letter, to learn more. She should also look at both schools alongside her personal criteria for what she’s looking for in a college. And review their websites again. Which school comes up as a stronger match? If both are equal, she may need to make a last minute trip to see one or the other to decide where she will likely have the best experience as a student. Remember that May 1st is the final date to accept one of these offers. I have a background in music. I have been playing the piano since the age of three and I also play the alto saxophone. I don’t have a degree in music though. I have a B.A. in English Lit and a M.A. in Early Childhood Education. I currently work as a one-on-one special ed paraeducator in the Montgomery County School System in Kensington, MD. I work with a 1st grader who has Downs. I want to pursue a degree in music therapy but I’m not sure where to begin. Would I pursue a M.A. since I’ve already completed my undergrad or would I have to start fresh with a B.A. in music therapy? Check with any of the music therapy programs you’d be interested in attending to see whether you could qualify for their Equivalency Programs if you took basic core music classes first. Note that these programs are mainly for music majors who majored in a field other than music therapy. Also note that you will need to pass proficiency tests in voice, keyboards, and guitar to become credentialed as a music therapist. If you didn’t have any, or enough, undergraduate music courses to enter a Masters equivalency program (meaning you take all undergrad classes required for music therapy while also pursuing a master’s degree in music therapy) you have two other options. One is to pursue a bachelor’s degree in music therapy. The other is to take music therapy undergraduate equivalency classes – in other words since you already have at least a bachelor’s degree, you just take the classes required for music therapy that you have not already had. For me, it did not make a difference. I changed careers to become a music therapist. By the time I took all of the equivalency classes I had earned a B.M. in music therapy! I did it in 2 years but I think most people in that situation take 3 years for their studies. No matter what route you take, you will finish your training by completing an internship lasting approximately 6 months. I am a freshman in college about to be a sophomore and I have a passion for music and have been strongly considering majoring in music therapy, and will be declaring music therapy as my major. I considered majoring in psychology when I first began college and took general psychology. I go to a 2-year school that does not offer AMTA. I’m trying to figure out if I should focus more on psychology or music. I’ve taken 4 music classes in my 2 semesters, one of which is an honors program and only one psychology class and have just recently began looking into music therapy and I know of a school that does offer AMTA programs and I was just looking for advice on where to begin my music therapy. We suggest you contact the school where you’re thinking you would transfer to, and ask them for advice on which classes to take in order to audition well for their music therapy program. You’ll also want to check with their admissions office to see whether you’ll get transfer credits for the classes you’re taking at your current school. This will hopefully prevent you from having to repeat classes. We also encourage you to look more closely into the profession of music therapy by talking with one or more music therapists, shadowing them if possible, sitting in on classes at the school you’re interested in attending, reading all the articles on music therapy on MajoringInMusic.com, and doing some volunteer work in settings where music therapy is utilized. I’m a high school senior from Texas and I’ve been accepted and plan on going to Lamar University. My concern is that Lamar does not have a music therapy program or equivalency course. I tried to find a music therapist in my area to talk to, but there isn’t one. So, I was wondering, how would I go about getting certified in music therapy if there isn’t a school with the course near me? Congratulations on your college acceptance! If you major in music, you’ll most likely be able to apply to equivalency programs when you graduate. There are even online equivalency programs. Note that equivalency programs often tie in with music therapy master’s level programs. If I already have associates degree in Music, what will I have to do to transfer and major in Music Therapy at a university? Will the music courses I’ve taken count towards the Music therapy program or will I have to start from the beginning besides the taking general education courses? You will need to check with the school(s) you’d like to transfer to. A lot will depend on what you took at the community or junior college, your grades, and how the classes you took measure up to those at the school you want to transfer to. It’s possible that some of your gen ed classes will apply; music classes are more debatable. Again, check with schools with music therapy programs that you’re interested in possibly attending. To become a music therapist do I have to be able to read music? I have self taught myself to play guitar, drums and sing. I also have played in a couple of bands. have also composed songs and record them. Is there a way to get a degree on line with an accredited college in N.Y. I am very interested in pursuing Music Therapy in undergrad. I am also very interested in becoming a professional singer, and getting a BM in Vocal Performance at a conservatory. I have auditioned at many places, but not a lot of them are AMTA approved schools. I know you need to go through the equivalency program for music therapy before a master’s degree in Music Therapy, but how could I do that if I go to a school that is not AMTA approved? Is it possible for me to take summer classes at a nearby AMTA approved school to complete the equivalency program that way? Also, the schools that I applied to that are AMTA approved schools are Southern Methodist University, Hayes School of Music Appalachian State University, and Baldwin Wallace University. I have not received acceptances yet, but if I happened to get in, which would be the best place for me to apply? At SMU, I could double major in Vocal Performance and Music Therapy and pursue both. This seems like the best option, but I still would like to become an opera singer. Is this an impossible feat? Thank you. We’re confused! Are you applying to vocal performance programs or to music therapy programs? If opera is your passion and career goal, then we suggest you apply to classical voice programs instead of music therapy. Music therapy programs will provide you with the knowledge, skills and experience to prepare you for the credentialing exams in music therapy. Note that voice proficiency is part of the music therapy curriculum. With an undergraduate degree in music therapy, you can apply to master’s programs in music therapy. The equivalency program, which typically takes 1 1/2 – 2 years, is for those with a bachelor’s degree in music but not in music therapy. It prepares them to go on into a master’s degree program in music therapy. We suggest you read the other music therapy articles on MajoringInMusic.com to learn more. We have not heard of students double majoring in music therapy AND vocal performance. If you are applying to music therapy programs, check with the schools you are applying to, in order to see how you can add more vocal performance instruction and performance opportunities into your course load. Do you want to be a music therapist and an opera singer? If so, people do double major, although often it’s music therapy + music education. It is possible it will take more than 4 years to complete your studies. You would want to attend a school with strong programs in both subjects. Talk to the music therapy program directors at the schools you’re interested in about how you might pursue both careers after graduating. I was wondering if there are music therapy grants/scholarships (in USA, Canada, Australia, EU, New Zealand) for international students (specifically Asians) that you know of? If there are, do you have suggestions on how to find/inquire for them? I’ve been searching the internet for some time now but finding one is soooooo hard. I also want to know what an equivalency program is. I’m not sure what that is since we don’t have that in my country. We also do not have established music therapy programs here yet. Do you think that my background in music will help me get into a program and a scholarship? I am classically trained in piano, voice and guitar and I’m also a music education student. I’m pretty sure that music therapy really is my calling. I think it’s one of the most fulfilling job in the world!!!! Aaaaand this is a very helpful article for us young people who want to become music therapists. Thank you for sharing!!! Thanks for your kind feedback – we really appreciate it! You must be admitted to a school’s program before the school will offer any need-based aid and/or merit scholarships. Much of the additional financial aid in the U.S. is through the U.S. government and only U.S. citizens qualify. We recommend you explore the websites of the American Music Therapy Association and the World Federation of Music Therapy to get more information. To learn about the equivalency program, read additional articles on MajoringInMusic.com about music therapy and read other comments as well (Music Therapy category). You’ll see that an undergraduate degree in music is an ideal background for the equivalency program. On the side of each article is a list of the music schools we work with that have music therapy programs; most if not all also have equivalency programs. Visit their participating school pages to learn more. Note that one of these, Saint Mary-of-the-Woods also has a distance-learning equivalency program. Thank you for the advice! 🙂 It helped me a lot. I graduated with a BM in Music Performance and have since had experience in schools working with students with mental disorders, severe and handicapped, etc. I’m not in a place to obtain a Music Therapy degree in the near future (though it’s in the plan once I move to a better area to study), but I was curious if real-world experience could contribute to fewer classes/practicums required for the degree? In the meantime, would I be able to transfer in credits from other courses (say, psychology courses from a community college) required before entering into the Music Therapy coursework to save time during the Equivalency program? It sounds like you have a great background for going into music therapy. Chances are that the experience you refer to in your comment combined with your background in performance would make you a stronger candidate for acceptance into a music therapy program, and help clarify in what area/s you’d be interested in working. But whether experience would replace any of the music therapy requirements is, in our minds, unlikely. But don’t let that stop you from contacting some of the music therapy programs you’re interested in – they will be the best at answering your question accurately. We also suggest you look at Saint Mary-of-the-Woods (they’re a participating school on MajoringInMusic.com, so you can check them out right from the website). They offer a distance-learning equivalency program. Yes, you can transfer credits. You’ll need to know what school you’re going to do your music therapy program at because you must be sure the credits will transfer before you take the classes! Personally, the psychology classes I took during my first bachelor’s degree transferred to a music therapy program. I also took as many classes as I could at a community college (e.g. sociology, biology) because it was cheaper. Hello. I am a sophomore looking to major in music therapy. Which high school classes are ideal to move onto majoring in music therapy in college? Since music therapy programs will require you to become proficient on keyboards, voice, and guitar, you would be wise to start lessons on at least one of those now. It would also be a good idea to talk with one or more music therapists and/or students already enrolled in music therapy programs and, if possible, shadow them for part of a day, to see what the classes are like and the work is really about. Some hospitals have programs run by music therapists where students can play music for patients and families in waiting areas – that would be another way to get a sense of whether this is the path for you to pursue. Be sure to read other articles on MajoringInMusic.com about music therapy. I’m currently a sophomore in high school looking to be a music therapist. Singing is definitely not my strong suit and I don’t know how to play piano or guitar. Clarinet is really my only instrument and I’m starting to get worried about some of these requirements. This is a career that I’m really passionate about and I’m hoping you’ll be able to provide some more tips or advice. As stated in all of the articles about music therapy on this website (do read them all! ), proficiency in piano, voice, and guitar are the required instruments in music therapy because they are the ones most often utilized. This does not mean that you have to be a virtuoso in these areas, just that you become proficient enough to pass the required exams to become a credentialed music therapist when you graduate. If music therapy is your calling, start getting some lessons at least on piano so that you have that under your belt before you are a senior and start applying to music therapy programs. As a college music therapy major, you will take lessons to bring your level of proficiency up to what will be needed to pass the exams. Read all of the articles about music therapy on this website. You will learn a lot about career opportunities in music therapy. Visit the website of the American Music Therapy Association to learn about other opportunities as well. Training in music therapy is very specific to the kind of work you would be doing in this field. I’m planning to leave school early to join a college course to do with music pop performance. I was wandering if a qualification from that would help me get into a music therapy course in university? The guitar, vocal, and keyboard proficiencies you’re likely to need for a popular music program are also those required in Music Therapy. You would need to enroll in the Equivalency Program to take the Music Therapy credentialing exam if you don’t major in music therapy, so check with schools that offer that program. Hi, I am currently a Junior in high school and I am curious about some things. To become a music therapist, do I necessarily have to play an instrument; I am singer aspiring to become a music therapist…..If I must play a instrument, do I have to know how to play one when I apply for the music therapy program in college? You will need to be proficient on voice, guitar and piano to become a credentialed music therapist. You’ll learn the skills you need in your undergraduate program. For your audition, you would audition on whichever of these you are strongest. Your audition will likely be compared to others auditioning for music therapy as opposed to classical (or any other genre) voice. It would be best to check with the specific schools you want to apply to, in order to find out if there are any differences in audition requirements for music therapy majors. You can start by asking those questions on the forms of the music therapy schools participating on MajoringInMusic.com. I am in need of some help and a bit of guidance. I am very interested in a degree in Music Therapy, I am currently a junior in college and taking psychology classes. I took Piano as a child and have a passion for Music. I am hoping you can tell me that if I were to start Music lessons and Music classes now if that is enough of a background to pursue a future career in music therapy? Am I in any way at a disadvantage by not having an extensive music background? Thank you so much for your help and your time. Karly, the equivalency program is offered by many schools with music therapy programs for those who have studied another area of music but not music therapy. It’s typically 2 years instead of the 4 years that a music therapy program takes. But there are some schools that will accept you into the equivalency program with a music-related degree, and sometimes psychology will get you in the door. Look at schools you may be interested in and check their equivalency program admission requirements. You can click on the schools listed on this article as a great starting place. Note that to become a credentialed music therapist, you’ll need to pass proficiency exams in voice, guitar, and keyboards. Your background in piano will certainly help with the keyboard component, although you may need additional lessons to bring yourself up to speed. I am planning on becoming a music therapist. I am a senior in high school and I was wondering if there is any way for me to be eligible to become board certified with a music degree plus additional education and training. Would this add more years to my education? I would be going to a school that does not have an AMTA approved program. I am curious if there is a way I can take classes that may not be provided there online or elsewhere. I’m very interested in pursuing music therepy, however the college that I want to go to does not offer it as a major. I was wondering if I could major in music and minor in psychology, then earn my graduates at a school that provides music therepy. How long would that take if I could? As long as you major in music, you will be able to apply to schools that offer the degree equivalency program in music therapy. See this article, Becoming a Music Therapist, for more specific information. Note that you’ll also need to pass proficiency exams in voice, keyboards, and guitar in order to become a credentialed music therapist. I have a BA and an MA in Elementary Education. I am dually certified in General and Special Education grades Pre-K to 6. I am looking to take some introductory courses in music therapy toward my 30+ credits. I would preferably like to work on this during the summer which is when I am free. Does anyone know of any programs available in New York or New Jersey or even online courses? 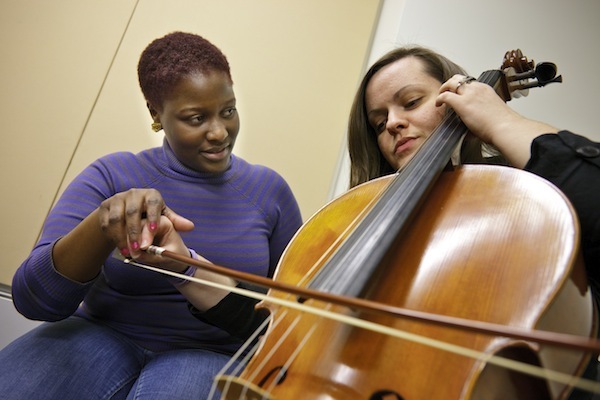 In the article, Becoming a Music Therapist, you can learn about the degree equivalency program. It is offered by many of the schools approved by the American Music Therapy Association (AMTA) for those who have completed an undergraduate degree in a non-music therapy field. Note that you will need to pass proficiency exams on guitar, voice, and keyboards as part of the process for becoming a music therapist. Check AMTA’s website for schools in the NY/NJ areas. We do work with Temple University in nearby Philadelphia, and we’ve discovered another of our participating schools on MajoringInMusic.com, Colorado State University, does offer an online program in music therapy. Thank you for the helpful information on this web site. In looking at the web sites of colleges offering music therapy programs, I see that some offer a Bachelor in Music Therapy degree (for example, Shenandoah University) while others describe their degree as a Bachelor in Music degree with a “concentration'” in music therapy (for example, Radford University and Cleveland State University). Other schools’ degree programs are described still differently. Is there a substantive distinction between obtaining a Bachelor in Music Therapy degree and a Bachelor in Music degree with a “concentration” in MT? Each of the three above-referenced music therapy programs are approved by the AMTA and, as I understand it, graduates from these schools are immediately qualified to take the certification exam. Thus, is there some important distinction between these programs? Can the student who graduates with a bachelors in music with a “concentration” in music therapy obtain a master’s degree in music therapy without having to take additional classes in an equivalency degree program? When looking for a job, is there some advantage to having the Bachelor’s in MT over a Bachelor’s in Music with the “concentration” in MT? Thanks for helping sort through this. The American Music Therapy Association tells us that any AMTA-approved school prepares you to be eligible to take the national certification exam. The schools themselves may list their programs as BS or BM in Music Therapy or BM in Music with a Concentration in Music Therapy. The name of the degree is based on the inner workings of each school, not on the credibility of what they offer. So look at the programs themselves, where they are, who’s on faculty, etc. and don’t worry about the name of the degree. As long as the school is AMTA-approved and you successfully complete an AMTA-approved program and the certification exam, you can skip the equivalency degree program and go directly into a master’s in music therapy program. According to AMTA, it won’t matter to future employers whether you get a music therapy degree or music degree with music therapy concentration. What will matter is that you’ve attended an AMTA-approved program; your internship experiences; and how you present what you know. I am currently almost finished with my first year of college, but have recently figured out that I want to pursue music therapy. I am considering leaving my current university and just attending a community college instead to finish my general education and then transfer to a school with a music therapy program. I have looked at the AMTA-approved list of schools but was wondering if you knew of any schools that are better or higher-ranked for music therapy than others? And also, is it required that music therapists attend a graduate program? Or is it possible to get jobs with just a bachelor’s degree? Discuss your plans with some of the schools you’re interested in attending. They will be able to advise you about what classes you should be taking right away so that you don’t have to extend your undergraduate education. You will definitely want to attend an AMTA-approved school and you can start by looking at the schools with music therapy programs on MajoringInMusic.com. You can learn more about their programs by clicking on each of the schools listed on the side of this article. When you check their admission requirements, you’ll also see that you need to audition to be accepted into a music therapy program. Whether you need a graduate degree depends on the kind of work you will want to do when you graduate. Check out the other MajoringInMusic.com articles on music therapy to learn more. I am a senior in high school who will probably be attending the University of Wisconsin-Madison (I read that Karen Goodman went here too! For what?) next year. This decision was between here or the University of Minnesota, to which I was accepted into their music therapy program. However, I have chosen Wisconsin because I am still not sure as to which way I would like to go musically… I am very interested in music therapy, but I am concerned about finding jobs in the field and being able to get my piano and guitar skills up to par. At the University of Wisconsin Madison, I will most likely be pursuing a double major in communication disorders and music. I am just wondering… Do you think that this is a good combination of degrees if I want to eventually pursue some sort of equivalency degree in music therapy? I have heard of much opportunity for collaboration between SLPS and music therapists, so I thought maybe this would work out. Also, as Wisconsin does not have a music therapy program, are there any schools in WI or near WI that do have an equivalency program? The closest schools participating on MajoringInMusic.com with music therapy equivalency programs are Western Michigan University (Michigan), Baldwin Wallace Conservatory (Ohio), and Saint Mary-of-the-Woods (Indiana). Go to their school pages on MajoringInMusic.com and ask them questions directly on the forms on each of their pages. Also look at other possible schools on the American Music Therapy Association’s website. In addition, we suggest you read all the other music therapy articles on MajoringInMusic.com to gain more insight about preparing for and working in this field. I’ve always really liked psychology and music and now just discovered Music Therapy. I believe this is something I’d really love to follow in the future but I have some questions that have been concerning me. Is Piano and Guitar really necessary? I play low brass instruments and also bass guitar and I was planning of go around this route instead of Piano and Guitar. Also, I was looking at some colleges and I wanted to know what you guys believed was better, Nazareth College in NY or Montclair State University in NJ? A music therapist is expected to be proficient on piano, guitar, percussion, and voice. According to Brian Wilson, director of the music therapy program at Western Michigan University, you don’t need to be a superstar to get by. What you do need to be able to do is match pitch, find starting pitches, and feel comfortable using your voice on a daily basis. You will certainly receive vocal training in a music therapy program, but you need to enter that program with these capabilities. As for choosing a school, MajoringInMusic.com does not advocate for one school over another. We do recommend that you take into consideration a number of factors to determine where to apply. See Which Music School Fits You? for general guidance. Also visit the website of the American Music Therapy Association for more information. Hi, I have just discovered music therapy not too long ago. I have been taking piano lessons for 6 almost 7 years now, and I am very good at it. I also just started taking guitar lessons. What worries me is the vocal part of the music therapy requirements. I am not tone def and I could be taught how to sing, but i don’t have the best singing voice and I feel self conscious singing around others. Will a music therapy college help me overcome this? I would prefer to not sing at all when I become a music therapist and instead just play instruments. Is this an option? A music therapist is expected to be proficient on piano, guitar, percussion, and voice. According to Brian Wilson, director of the music therapy program at Western Michigan University, you don’t need to be a superstar to get by. What you do need to be able to do is match pitch, find starting pitches, and feel comfortable using your voice on a daily basis. You will certainly receive vocal training in a music therapy program, but you need to enter that program with these capabilities. If you are uncertain about whether you have what it takes to do this, perhaps you can meet with a licensed music therapist to get feedback about your voice. We suggest you also find ways to reduce your anxiety about your voice, so that your talent isn’t blocked by stage fright. If you have a concern about your vocal health, Professor Wilson suggests that you see a speech therapist or audiologist for feedback and suggestions. I’m a Chinese student in Shanghai Conservatory of Music. I have 4 semesters for my diploma in music, my major is musicology. I can play piano but just a general level. Now I have known that if I want to join a master‘s program, I need to complete the degree equivalency program in music therapy, but how much time will the program take? 1 year or more? I also want to know is it necessary to learn Guitar? And what level do I need in piano.Thank you so much, hope to hear from you soon. According to the American Music Therapy Association, how long it takes to complete the equivalency depends on what kind of undergrad degree you have. Is your diploma in music comparable to a bachelor’s degree in music in the U.S.? As for specific competencies in piano, voice, and guitar, check with the AMTA website or with any of the schools where you’re interested in studying. I am currently a student at Fitchburg State University in Massachusetts, and was wondering if someone could answer a few of my questions? Here at FSU, they don’t offer a music therapy degree, however, I am very interested in pursuing a career in this field. I will be graduating in the spring with an interdisciplinary studies degree in psychology, sociology and music. I was thinking that I would take the equivalent to the bacholor’s degree for music therapy, and was wondering how I could go about getting any experience in this field to see if this is really what I want to do. I would love to have some first hand experience in this field, but have no idea who to contact. Thank you. The American Music Therapy Association (AMTA) suggests you contact one of the music therapy schools in your area (Anna Maria College, Berklee College of Music, Lesley University are all Massachusetts schools with music therapy programs). See if they can connect you with a few music therapists, and then see if any of those individuals would allow you to shadow them for one or more days to get a better sense of what they do. Please let us know how this works for you! We address this in the article “Becoming a Music Therapist.” Be sure to check the tips in the sidebar (“How Do I Know Music Therapy is Right for Me?”) to help you figure out if a career in music therapy is a good fit for you. Hello. I am from Malaysia. I’m in my last semester for my diploma in music, major in piano. I’m really interested in music therapy. May I know, is it possible I can continue music therapy course after I finish my diploma course? Is it hard to get a scholarship? Thank you so much, hope to hear from you soon. We’re not aware of a music therapy organization in Malaysia to refer you to. Perhaps you can talk with a music therapist there to find an answer to your question. Also check out this free online world music therapy publication, Voices. In the U.S., there are equivalency programs open to people with degrees in related fields. Since schools differ in what they’ll accept as a background for admission into their Equivalency programs, check with the schools you’re interested in.. Read Becoming a Music Therapist for more information. If I graduate as an undergraduate with a music performance degree, will it help me be accepted into a MA music therapy program? You’ll find that most of the schools on MajoringInMusic.com with music therapy programs (see sidebar in this article) do offer the Degree Equivalency Program” for people like you, who have a related degree. Hello, I’m very interested in music therapy. I currently hold a grade 8 certificate in Yamaha and am still continuing my studies there. I will graduate high school next year and I am looking for a good university. I come from Indonesia where music itself is not well developed. There is one university that offers the program here but my friend told me that it is not very good since not a lot of people actually enroll in the major. I’m looking for opportunities to go abroad but I do have some financial issues. I really like Berklee but it is very expensive. Are there other universities that offer a good curriculum but not as pricey? And do you think it would be better for me to stay in state or go abroad? I am afraid if I force myself to go to the university here, I wouldn’t receive the exposure needed. Thanks in advance! For starters, check the schools on MajoringInMusic.com with music therapy programs (see the schools listed on the right side of this page). You can see more schools on the website of the American Music Therapy Association. Try comparing the curriculum at schools closer to where you are, to U.S. schools. Is the curriculum very different? Also talk with people who work in music therapy closer to where you live –– where did they study? Did they get what they needed to work in the field by going to school where they did? Hello, I am a high school senior and I’ve got about 5 days left to make the final decision as to which collegel I am going to attend for Music Therapy. My three choices are Berklee, Temple, and SUNY New Paltz. If you have any advice or information that might help me make a decision between these three schools please let me know ASAP. Thanks! We recommend you start by doing some reading – check out Kate Pukinskis’ article, “Which Music School to Accept?” and Steve Lipman’s “Which Music School Fits You?” Both are on MajoringInMusic.com under the “Advice” navigation tab. Create a list for each of the three schools you’re still considering. Use a rating system (e.g., 5 = highest, 1 = lowest) to judge each school by the criteria mentioned. Which school shows up as the strongest? Then…get sleep. Lots of it. If your personal rating system doesn’t clarify the best choice, being well-rested is likely to get your inner wisdom going. Tune inward and listen for which school makes you feel excited and eager to be a student there. If you find you have some questions about any of the schools, contact the admissions director and/or the chair of the Music Therapy Department immediately. They’re likely to be overwhelmed by last minute details so try to keep your questions as specific as possible. Let us know how you make out! Selecting a college is very exciting… and is a personal decision. I am a Temple University graduate — and Dean of the Professional Education Division at Berklee College of Music (the Division comprised of 5 departments — including Music Therapy). You have great choices — so I advise you to look closely at the faculty, opportunities to get practical training in practicum settings, and activity of the department. At Berklee, we have one of the largest Music Therapy departments in the nation led by Dr Suzanne Hanser, Chair. (Google Dr. Hanser when you have a chance… I think that will be helpful!) In addition, our students complete 5 levels of practica training (that supplements class instruction) in Boston — including some of the finest hospitals and other healthcare settings in the world, etc. We are in a unique setting in this regard. My last advice is for you to look closely at the activity of the department — looking for engagement in the profession and participation in events that advance music therapy. In my opinion, the experiences you have as a student — beyond the classroom — are essential, and vary from school to school. Best wishes with your decision making… and in your educational career! If you select Berklee, be sure to stop by my office when you arrive in Boston to say, “hello”! Great that you’ve discovered a new passion within music! Check out the music therapy curricula at the schools on MajoringInMusic.com that offer MT programs. That will give you a good sense of what you need to have under your belt in order to pursue music therapy. You’ll see that both piano and guitar proficiency are expected, so you’re on the right path. Also explore the website of the American Music Therapy Association. Note that AMTA states that “A Degree Equivalency Program is offered by many AMTA-approved degree programs for individuals with bachelors degrees in related fields.The student completes only the coursework necessary for equivalent music therapy training without necessarily earning a second baccalaureate degree.” Because you will have a bachelor’s degree in music, you can apply to a master’s degree program in music therapy. You will need to do the 60 credit equivalency/masters program. Hi my name is Eri, and I am currently double majoring in BM in Music and BS in Psychology, at Barry University, Miami. I’m a junior but I think I need at least two more years to finish both my majors. I’m a pianist and I was thinking about applying to a graduate school for piano performance after graduation and then getting my Phd in Psychology. But recently, I had to start my thesis, as an Honor Program student and I decided to talk about music therapy as a combination of both of my majors. I found this field very interesting and I’m starting liking it more and more and I’m even thinking about doing an internship on that. My question is if I finally decide to go after music therapy do I have to change my majors and be enrolled in an undergraduate music therapy program? Can I get into a graduate school for music therapy by having two undergrad degrees in Music and Psychology? Any type of advice would be helpful. Thanks in advance. My name is Olivia and I am currently a freshman studying music performance at Oral Roberts University. My main instrument is the harp, but I also play the piano, sing, and am planning on learning how to play the guitar this summer. I have always wanted to go into music therapy but I also didn’t want to leave my school. What do I need to do to have music therapy taught at my university? I would like to double major or possibly even switch completely to music therapy. One of my professors talked about music therapy this morning with my class and asked for our input. I suggested we offer music therapy at ORU and she agreed that it would be very beneficial to our music department. She also asked us to send her any ideas or further input to her via email or in person. Who do I need to talk to to get a music therapy program started at ORU? How long does this process take? Is there any way my university could offer music therapy in the fall? I am very interested in pursuing this and I am willing to talk to anyone if means it will be taught at my school. I would appreciate any guidance or information. Any advice given will be taken very seriously as I am only at the beginning of pursuing this dream. The fact that one of your professors is asking for student input may be a sign that the school is considering starting a music therapy program. See if that professor would be willing to introduce you to the faculty person or administrator who may be overseeing the development of such a program. Maybe your input can help drive the development of a music therapy program at your school. The American Music Therapy Association can help you with this, so plan on contacting them. But note that new academic programs take time to develop and meet the school’s criteria before they launch. Faculty need to be hired, the program needs to be incorporated into the academic as well as marketing plans. That could take a few years. If you are committed to staying at ORU whether or not it offers a music therapy program before you graduate, look at the curricula offered by schools with music therapy programs mentioned in this article. That will give you a sense of what kinds of classes music therapy undergrads take. See if your school offers similar classes for you to take. Appalachian State’s Hayes School of Music, Baldwin Wallace Conservatory of Music, Colorado State University, Saint Mary-of-the-Woods College,Temple University Boyer College of Music & Dance, University of the Pacific, Western Michigan University School of Music. Use the “For More Information” form on their pages to send them your specific questions. They promise to respond! Hello, my name is Jacob. I am a sophomore at Bowling Green State University (BGSU) studying music. I am interested in music therapy, but unfortunately, BGSU does not have an undergrad music therapy program. Even though BGSU does not have a therapy program, would it still be possible for me to go to grad school and earn a music therapy degree? I am looking into minoring in psychology, if that helps anything. Also wondering, if there are any graduate programs for music therapy in California? I am a percussionist, studying percussion. Previously I have taken private guitar lessons, and I was required to take group piano one and two for my major. I’m not sure if this will help either. Any advice will be greatly appreciated. Thank you! Thanks for your comment. Good to hear that you’ve studied guitar and piano –– music therapists are required to have proficiency in these as well as voice. According to the American Music Therapy Association, University of the Pacific in Stockton, California, has a graduate program in music therapy. Check them out right here on MajoringInMusic.com. Do you want to fill out their form for more information or can we send them your contact information? NOTE that if you get a bachelor’s degree in music, you can go to graduate school for music therapy by doing the equivalency/masters, 60-credit program (takes 3 years to complete). The American Music Therapy Association states that “A Degree Equivalency Program is offered by many AMTA-approved degree programs for individuals with bachelors degrees in related fields.The student completes only the coursework necessary for equivalent music therapy training without necessarily earning a second baccalaureate degree.” But do ask University of the Pacific and any other schools you’re interested in (see list in this article) specifically about what you need to do as an undergraduate right where you are, in order to get the bachelor’s in Music Therapy as well as to go on to grad school. While not all jobs in music therapy require graduate school, they may in the future. I am from Malaysia and i just finish my high school exams. Currently I am waiting for my results and finding a college, I am interested in making music therapy as my career, but i am afraid of not being able to find a job here in Malaysia. Besides I do have some financial difficulties in going overseas to further my studies as Malaysia doesn’t seems to have this course available. I need some advice should I continue my dream to become a music therapist or forget about it and find other option. To learn more about how music therapy is currently being used in Malaysia, visit musictherapymalaysia.com and medicinemalaysia.com. There are schools all over the world offering music therapy programs. Some of the closest to you may be in Australia. Also check out the World Federation of Music Therapy. We hope you’ll also check out some of the U.S. schools mentioned in this article. Hey Marcus, I’ve done my research about majoring in music therapy and actually you could get a FIM course in ICOM first for a year (3 sems) and then get yourself transferred to Berklee College of Music at Boston, USA. Seems like ICOM is the only college in Malaysia that can get you linked up with Music Therapy. Hope that helps. I just received my BS in Psychology last year and I minored in biology and music with a focus in vocals. I’ve been thinking about becoming a music therapist off and on for some time now and I believe my doubts were driven by the limits of the music program at the college I attended. Now that I’ve had more time to research MT, my interest has resurfaced. What I’d like to know is if there are any master’s program that may accept me with me what I have so far? Might I need to take specific classes only? Or would I more than likely have to start completely over at the undergraduate level? Please help. Thanks! You need a bachelor’s degree in music to go on to do the equivalency/master’s program. Without a degree in music, check out the Degree Equivalency Programs at schools offering music therapy. Instead of getting a second bachelor’s degree, you complete the coursework necessary for equivalent music therapy training. ?Start by looking at schools on MajoringInMusic.com with Degree Equivalency Programs. Use the information forms on each school’s page to ask specific questions. Does this answer your question? I am currently a Childhood Education major with a concentration in music. After earning this degree, can I go on to receive a masters degree in Music Therapy? Or, do I need to enter the Music Therapy Undergad at my school? We’ve discussed your question with the American Music Therapy Association. They tell us that a degree in Early Childhood would not allow you to enter a master’s degree program in music therapy. Did you minor in music? If so, check with schools offering music therapy programs to see if you have enough music credits to allow you to take the Equivalency program outlined in many of the other responses above. Otherwise, you may have to get a bachelor’s degree in music therapy. Hi, I was curious about my minor with my major. I want to major in Music Therapy, so what all are my options as to what I can get as a minor in something? Minors require specific numbers of credits, so you need to see whether you’ll have enough room in your schedule to minor in an area you’re also interested in, especially if you plan to graduate within four years. Start by reviewing all the schools listed in this article. Click on their pages on MajoringInMusic.com. Use the “I’d like to know more about (school name) form on each school’s page, to ask specific questions of each school you might like to attend. Also check with the American Music Therapy Association to learn about other music therapy programs. I am an freshman at SDSU studying voice. I would like to go into music therapy, but SDSU does not offer a program for it. Since I want to stay at SDSU for now, should I get my undergrad degree as a music ed or music performance major if I eventually want to go into a music therapy career? The American Music Therapy Association states that “A Degree Equivalency Program is offered by many AMTA-approved degree programs for individuals with bachelors degrees in related fields….The student completes only the coursework necessary for equivalent music therapy training without necessarily earning a second baccalaureate degree.” We recommend contacting schools you may want to attend to get your credentials in music therapy. Start by checking out these schools on MajoringInMusic.com with the Degree Equivalency Program: Appalachian State’s Hayes School of Music, Baldwin Wallace Conservatory of Music, Colorado State University, Temple University Boyer College of Music & Dance, University of the Pacific. Use the form on their pages to send in your specific questions. They’ll respond and they’ll also make note of your interest (very useful for standing out from the crowd of applicants!). You can also get more information by filling out the inquiry form on CSU’s page on MajoringInMusic.com. After the holidays, they will forward it to appropriate contact there. Hey I am an undergrad major at UCLA in voice. Are there prerequisites I am going to have to have completed before applying to grad school for music therapy? Thanks for your question. Start by taking a look at each of the participating schools on MajoringInMusic.com that offer music therapy programs (see a list of them with links in this article). Once you’ve familiarized yourself with what each of the schools offers, go ahead and ask your questions to the individual schools by using the inquiry forms right on their MajoringInMusic.com school pages. That’s what they’re there for, and the schools are eager to hear from you. You’ve picked a wonderful field to enter and we wish you all the best as you pursue music therapy. Note that courses in psychology, piano, and guitar will be useful to you should you decide to do the equivalency or equivalency/master’s program. Hey folks, hope someone might be able to give me a bit of guidance today. I got my BA in political science in 2008, then did a Peace Corps service and worked in China during the following 4 years. Meanwhile, I’m self-taught in 4 instruments and have been writing songs, putting out albums and performing for many years. Having left China, I thought I’d follow my passion for music by going full time as an independent musician, but so far the job is 90% marketing and sales, with little time for music, and I’m really disillusioned by the culture of selfishness and endless pitching that permeates the business. Only now have I discovered Music Therapy, but based on initial research it seems like it could be the direction I’ve been looking for in this life. I’m wondering if someone could give me some guidance or thoughts based on my situation, especially if you are someone who transitioned from one occupation to MT. Many thanks, for real. According to the American Music Therapy Association, you will need to do the bachelor’s degree in music therapy. You may be able to test out of some music courses but that would be up to the schools you apply to. Also, be sure to read Music Therapy: Making a Difference One Note at a Time, by a leader in the American Music Therapy Association (AMTA). You’ll see a list of schools on the right hand side, all of which have Music Therapy programs to check out and send inquiries directly to. I’m a high school senior, and I’ve been thinking really hard about music therapy, but also music education. I’m facing a huge decision, and need a little help trying to decide between the two… Could you possibly give me the pros and cons of music therapy, and the best schools to pursue if I live in Iowa. Thank you! Check the article, “Music Therapy: Making a Difference One Note at a Time.” It clarifies the difference between the work of a music educator versus a music therapist. It clarifies the difference between the work of a music educator versus a music therapist. According to the American Music Therapy Association, there are two schools in your state with music therapy programs. You can learn about music therapy programs directly from MajoringInMusic.com by exploring the schools with these programs. Look at the course requirements for music education against the music therapy requirements, and you’ll see clear distinctions between each of those majors. Kylie, if you work really hard and go one extra year, you can get both degrees! It was hard but I’m glad I did it! I will be a senior in high school next year, and would like to pursue music therapy. I would like to work as a music therapist within hospitals and working with people who have suffered from brain injury. Is there a school you would recommend that might have the resources to help me get to that? I suggest you start by looking at the schools with music therapy programs that have pages on MajoringInMusic.com – Colorado State University Dept. of Music, Theatre & Dance, Temple University Boyer College of Music & Dance. Contact each of the programs with any of your specific questions. Visit the AMTA website for more information. And be sure to read some of the other articles on MajoringInMusic.com about what it takes to find the right “fit” school for yourself. Note that according to the American Music Therapy Association (AMTA), undergraduate music therapy programs offer training across a wide spectrum of music therapy settings. The master’s degree level is where you are more likely to specialize in areas such as hospital-based music therapy applications. I’m very interested in the Music Therapy major and I’ve noticed that the main instruments are guitar and piano. I am a flute player and i was wondering if i could use flute instead of piano or guitar. Great question! According to Jane Creagan, Director of Professional Programs at the American Music Therapy Association (AMTA), proficiency in voice, guitar and piano are all required and are all taught in AMTA-approved music therapy programs. Many music therapists will use flute and other instruments in their work, but they are not substitutes for the requirements. In addition to the BA and the MA, some programs, including the one at Montclair State, also offer an Equivalency program which allows you to take the coursework necessary to train for the profession of music therapy and take the Board Certification exam necessary to practice professionally. The Equivalency program does not grant you the BA or the MA. As Sara points out, the additional credential will help you become more marketable. I have a BA in Music Education and would like to become a Music Therapist. What type of advantage would I have to obtain a MT certification? Greg, in order to be eligible to practice as a music therapist (and earn the credential of Music Therpist – Board Certified), you need to graduate from an approved music therapy program, either at the bachelor or master’s level. Music Therapy graduate programs differ in their required pre-requisites, so this could mean the difference between a 2-year Master’s program or a combined BA/MA program which could take longer. I am currently a graduate student at Drexel University in Philadelphia and some of my classmates have a BA in Music Ed. They did not need to do any additional coursework prior to starting the program. One advantage that you will have after completing a music therapy degree program is that some school systems will only hire music therapists that are certified to teach as well. I hope this helps answer your question!